You could feign surprise that Modus Operandi’s latest limited release is a New England style IPA. You’d fool no one. At least, no one that’s been paying attention. In roughly the past year’s worth of monthly one-off beers from the Mona Vale brewery, the bulk of them have been hazy or an IPA or both. Indeed, few local brewers have dedicated as much time and resource towards an apparent fascination with what became, with surprising rapidity, the defining beer style of 2017. And that may well end up being the difference between Dream Weaver and so many others. It seems like a beer that’s ceased its experimentation phase. It’s as if it’s taken this long to truly see through the haze and understand the yeast. You get the sense it's been a case of slow refinement through a lineage of beers that includes Yeast Coast, Gadzooks, Tropical Contact High, Triple Deity, Future Factory and the brewery’s small batch, Northern Beaches only, Insular Peninsula releases. Whether or not it is in fact the case, this feels like the one they’ve been working towards. It’s undoubtedly got the fruitiness and juice like character demanded of a NEIPA, but treads the line between that and a more traditional and bitter US IPA with a more solid footing. Of course it’s hoppy as hell, flush with tropical and citrus flavours plus a lick of pine on the back of the palate. Of course it's impenetrably murky. These are all pretty standard descriptors for this kind of beer, but the key is how they present on a balanced footing. 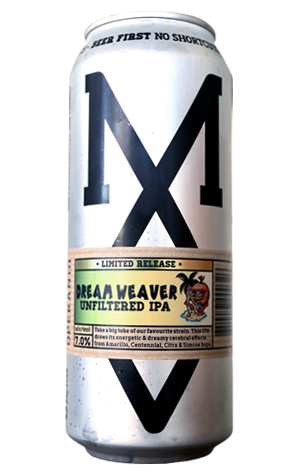 In that regard Dream Weaver is another example that demonstrates why Modus is one of a handful of breweries at the head of the class when it comes to IPAs, hazy or otherwise.